When the 1964 Yankees won what turned out to be the last pennant of the old guard, it wasn’t pretty. First-year manager Yogi Berra was the unsuspecting victim of backstabbing abetted by first-year general manager Ralph Houk. Age and injury began catching up to the team. Their sale to CBS rocked baseball controversially. And Berra was saddled especially by an unreliable bullpen. With Hall of Famer Whitey Ford beginning to experience elbow discomfort and Jim Bouton suffering an unexpected tired arm in the first half, lefthander Al Downing putting up a solid season wasn’t quite enough even if he would lead the American League in strikeouts. (He also led in walks, unfortunately.) Over Houk’s objection, still-co-owner Dan Topping made two moves before turning it over to the Tiffany Network. He ordered the call-up, from the Richmond farm, of a kid named Mel Stottlemyre, who’d grown up a Yankee fan despite living cross continent. His mild manner was probably the only thing mild about him. On the mound, the Missouri-born Pacific Northwesterner proved something else immediately. So did Pedro Ramos, a journeyman righthander who joined the Yankees that September's beginning. Stottlemyre would win nine of twelve starting decisions down the stretch including a five-start winning streak and two shutouts. Ramos down the stretch gave Berra and the Yankees the bullpen stopper they were missing since Steve Hamilton's early-season success dissipated. Stottlemyre—who died Sunday at 77, after a long battle with multiple myeloma—went on to beat Bob Gibson handily in Game Two of the World Series. He faced Gibson in Game Five and came out in a 2-0 hole (the Yankees would go on to lose); he faced Gibson again in Game Seven and was done in in the fourth, when rookie infielder Phil Linz couldn’t avoid a takeout slide on what might have been an inning-ending double play, turning instead into a Cardinals three-run inning en route the 7-5 final for the Redbirds. That wouldn’t happen for another decade. In the interim, Stottlemyre—whose money pitch was a filthy hard sinker—became the best pitcher on a Yankee club entering its lost decade. Ford’s elbow turned into his nightmare and the end of his career soon enough. Bouton developed serious arm trouble, enough to reduce him to a marginal relief pitcher. Downing proved talented, inconsistent, and injury plagued. The team’s other stars (Hall of Famer Mickey Mantle plus Roger Maris, Tony Kubek, and Elston Howard) surrendered to age, injury, or both. And except for pitchers Fritz Peterson and Stan Bahnsen, plus reliable (and underrated) outfielder Roy White, the parched farm produced journeymen at best. 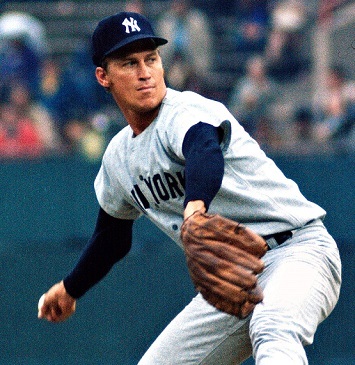 And Stottlemyre, who’d become a three-time 20+ game winner in his career, suffered the 1966 indignity of losing 20 games despite pitching to his normal capability and making his second straight All-Star team while the Yankees finished dead last for the first time since 1912. He suffered his highest ERA ever with a lower fielding-independent pitching rate (ERA minus defense) that was around his career norm; twelve of his 20 losses came when the Yankees gave him two or less runs to work with. He had four no-decision starts in which he pitched well enough to win, surrendering three earned runs or less; in ten of his losses he pitched well enough to win along the same criteria. Stottlemyre would have more individual moments, including the staggering inside-the-park grand slam he hit to beat the Red Sox in 1965. “I didn’t slide in at the plate so much as I collapsed,” he remembered. When the pitcher who surrendered it to him, Bill Monbouquette, became a Yankee in 1967, Stottlemyre relished needling him about it. He had it listed in the 1967 Yankee yearbook as his greatest baseball thrill. By the 1970s, he was accompanied by Peterson and then Bahnsen as the core of a promising new Yankee staff. It lasted only long enough for Bahnsen, the 1968 AL Rookie of the Year, to be traded after the 1971 season; and, for Peterson and fellow pitcher Mike Kekich to swap families notoriously in spring 1973, prompting the eventual trades of both. Stottlemyre and his wife, Jean, were close to both pitchers and their wives and couldn’t figure how the deal could have been done without them figuring something was up. Not until the day Kekich, according to Stottlemyre, called to ask if he’d heard about the trade. Knowing both Peterson and Kekich were first class pranksters, the Stottlemyres first thought it was one of their gags. It turned out to be nothing compared to how Stottlemyre’s career ended. After George Steinbrenner bought the Yankees in 1973, and Stottlemyre landed himself an $87,500 salary for 1974 following his first-ever contract holdout, he felt something pop in his shoulder that June. What popped was his rotator cuff. Season over. The following spring, after an off day fishing in the Everglades, Stottlemyre got a call to meet general manager Gabe Paul. Released. The day before his $30,000 severance would vest. Stottlemyre fumed and went home to Issaquah, Washington, twenty minutes outside Seattle. But after a spell as a pitching coach in the Mariners’ system before joining the Mets as their pitching coach for their mid-1980s glory seasons, he worked two years for the Astros in the same job. Then, of all things, the Yankees wanted him back. To become Joe Torre’s pitching coach in 1996. He added four Yankee World Series rings to the one he won with the 1986 Mets. Then Steinbrenner angered him again, this time after the Angels beat the Yankees in the 2005 American League division series and Steinbrenner congratulated Angels manager Mike Scioscia—whose team had been the only one to beat Torre’s Yankees consistently over the years, in regular season as well as postseason play—but said nothing for Torre. The usually mild Stottlemyre hit the ceiling. “To congratulate the other manager and not congratulate your own, after what he’s done this year, I laughed,” he said later. He laughed, and he quit. Except for a one-season return engagement as the Mariners’ pitching coach in 2008, Stottlemyre called it a career. In the interim, Stottlemyre had suffered great sorrow when his youngest son, Jason, died of leukemia at age 11; and, great pride, when his other two sons, Todd and Mel, Jr., became second-generation major league pitchers. Todd’s career outlasted his father’s by three seasons but earned him only half the wins above replacement-level his father earned; Mel, Jr.’s major league career lasted one season. Ten years after he left the Yankees for the final time, Stottlemyre was stunned to be invited to Old-Timer’s Day 2015 . . . where his entry into the Yankees’ fabled Monument Park was unveiled. There was probably nobody more shocked over it than Stottlemyre himself, who felt that as a pitcher he’d represented an era the Yankees and their fans would prefer to forget. Once upon a time, Stottlemyre’s uniform number—30, which hasn’t been retired yet (it was seen last on the back of now ex-Yankee reliever David Robertson)—was also a journalist’s code at the end of a good piece of copy. He wasn’t always good copy during his career, other than pitching and winning. But men who beat Bob Gibson in even one World Series game draw almost as much attention and respect as men who live well and battle more insidious foes with his kind of silent courage.